In this article from Nicky Percival Interior Design based in Tunbridge Wells with clients in Kent, Sussex and London, we look at the colour trends for 2019 and give you our top tips for introducing some of these great colours into the rooms in your home. Last year was all about bringing an edgier palette into the home–with vibrant reds, modern metallics, and variations of the statement black accent wall. Unlike 2018's color trends, 2019 is taking a more mindful, lifestyle-based approach to the development of new shades. 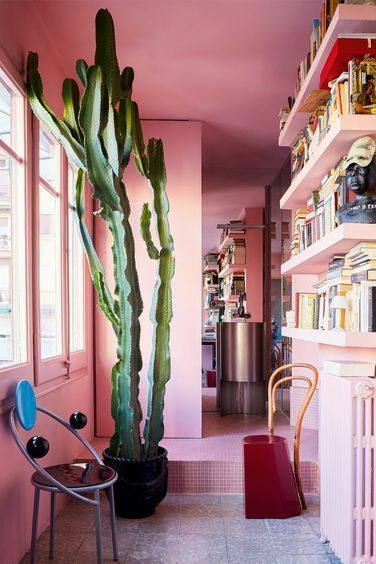 Most paint brands have released their colors of the year, including Benjamin Moore, PPG Paints, Sherwin Williams, and of course, Pantone's 2019 Color of the Year: Living Coral. From powerful aquas to soft terracottas, companies are connecting the dots between consumers' home lives, mental demands, and digital engagement, which inspired many of the color picks this year. We look at cool colours such as navy, sage green and greys and warm colours including coral, the Pantone colour of the year through to dusty pinks. We also see how colour can alter the perception of the shape and size of a room. Using colour in interior design is a way of bringing character and your personality to a room and there are lots of ways of doing it ranging from a dab of colour to a bold paint choice on a feature wall or adding colourful accessories and even furniture. By introducing colour carefully, you can make a room appear cosier and even seem larger. In this way, colour is actually altering the perception of the shape and size of your furnishings and the room itself. Colours can even affect your mood and determine whether you actually enjoy being in a room or whether it makes you feel uncomfortable. In general terms lighter and cooler colours appear to recede and so are good choices for rooms you want to make feel bigger whereas darker colours and warmer colours on the other hand seem to move towards us giving the appearance of less space. With colour you can draw attention to the positive parts of the room, the focal points and conversely hide or minimise features that are less attractive. Stormy Navy is cold and bold and will bring a strong statement to any room and is actually gender neutral. It will combine fabulously with pale marbles, gold, copper or brass detailing for a sharp masculine look. Metropolitan AF-690 is the Benjamin Moore colour of the year. It is a silvery grey shade with cool undertones and is calm, composed and effortlessly sophisticated and will bring glamour, beauty and balance and is the perfect backdrop for any scheme. Sage Green is more comforting and warmer than any blue and is perfect for a winter sitting room. Using this colour will bring a connection with nature and feelings of optimism and peace. It will blend perfectly with hand-me-down furniture or flea market finds. It can also be pretty with florals or sharper when mixed with navy, orange or yellow. Colours to look at are Farrow and Ball Treron and Bancha from their new collection. Green Grey is a fabulous backdrop for a monochrome scheme or cool Scandi look. It is a graceful subtle colour and perfect background for accents to change throughout the year. Mint Green is light, bright and flexible and works well with all shades of grey or pastel lilacs and all of the pink hues mentioned above. Coral is the Pantone colour of the year. It is a colour that has been somewhat out of favour but has been regenerated. It is warm and soft and will add interest to neutral schemes or if layered in multiple textures, it will generate a full rich look. It is fabulous with darker woods such as teak or walnut. Pastel Coral is a softer shade and don’t be afraid to go mad with it and use it profusely. It works fabulously with mid century styling and other shades of green and can bring in a hot Mexican vibe if twinned with tall green cacti. It really does bring Wes Anderson Grand Budapest Hotel and Rajastan Palaces to mind. Dusty Pink is cosy and feminine and can be used on everything from walls through to accessories. It is a colour that is very popular with 2LG studio and Dmitry Reutov 1930’s inspired styling. It balances perfectly with charcoal and Farrow and Ball Sulking Room Pink is an excellent example. 2019 will be full of soft greens and sharp accents and every shade of pink from coral to dusty pink and combinations of all of them. Are you looking to change the colours in your home? You could just want to change one room or your whole house. If you are not sure what to do, contact Nicky Percival Interiors who will help you with choosing the right colours to reflect your personality so that you get the right balance. Please get in touch on 07773 372158 or email nicky@nickypercival.co.uk for a without obligation chat.